Walkers Farmshop and Florist has been serving the local community since 1982 with quality fruit, vegetables and flowers. The farm Shop has been in the family for over three generations and believe's you should "feel good about food". The florist later developed in 1985, where our highly experienced design team always offer creative and imaginative ideas for the perfect floral display; all created using only the finest flowers available. At Walkers we specialise in every occasion. Wedding flowers individually designed for your perfect day, from bridal bouquets to church and venue flowers and set-up. Funeral and sympathy tributes tailored to your personal requirements. A fabulous array of gifts, balloons, bears and premium chocolates. 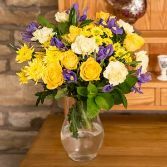 All flowers are personally delivered by our team of drivers throughout Stoke-on-Trent, offering same day and next day delivery. 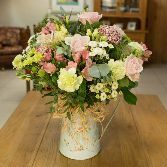 Our iflorist relay service provides National and International delivery. Most recently we have introduced our very popular fruit and veg home delivery service; delivering fresh, flavoursome, local produce direct to your door. We provide a pleasing alternative to the supermarket as we have always remained passionately devoted to our customers, local suppliers and farmers.